Nutrition experts have discovered another trick to combat overeating: Smaller plates. You’ve probably heard about the research from Cornell University showing that smaller plates lead to smaller portion sizes. Great idea, but I think there needs to be an exception for vegetables–salads in particular. In fact, there needs to be not just an exception but a reversal of the rule. In other words, follow the small plate approach for the meat and starch portion of your meals. But inasmuch as only one in ten of us eats the recommended daily quota of vegetables, stick with a BIG plate (or at least a separate small plate) for vegetables. If small plates lead to small portions, then it stands to reason that big plates will lead to bigger portion sizes. In the case of salads, consider using a big bowl instead of a plate. That way, you can adequately toss salad and dressing. I discovered this trick when a Mad Greens restaurant opened nearby. It is like a restaurant-controlled salad bar. You pick out the ingredients of your choice and the staff assembles it. But here’s the key: the salad is assembled in a BIG metal bowl, so it can be easily and thoroughly tossed. In the end, every piece of the salad is perfectly coated, and it tastes superbly flavorful, even with a only a couple squirts of dressing. Eating my Mad Greens salad was an “ah ha” moment. The low-fat 90s had taught me to avoid the globs of dressing restaurants ladle on salads. Instead, I always ordered my dressing on the side. At home, I never dressed the entire salad so the leftovers could be stored for the next night or two. So I grew accustomed to pouring a little dressing on top of my salad and then semi-mixing it in, since it is impossible to properly toss a salad on a tiny salad plate or piled next to meat and potatoes. Salad would end up all over the table. So for years I made do with a semi-dressed salad: Some bites would have mouth-puckering amounts of dressing; some would have none. Mad Greens introduced me the taste of a well-dressed salad-and happily, it isn’t dependent on GLOBS of dressing, just proper tossing–and for that a big bowl is the key, just like it’s the key to eating a goodly portion of salad. So in a happy coincidence, I could achieve two good things with one simple change. I first began serving my salads in a round plastic storage container. A mixing bowl will also work. But today, I found a very lovely yellow bowl (probably a small casserole dish?) at The Peppercorn, our local kitchenware store extraordinaire. Depth is a key characteristic for a good salad eating bowl. This one does a perfect job containing a salad of winter vegetables topped with canned tuna steaks, sun-dried tomatoes and raisins. My current dressing favorite is shown, too. 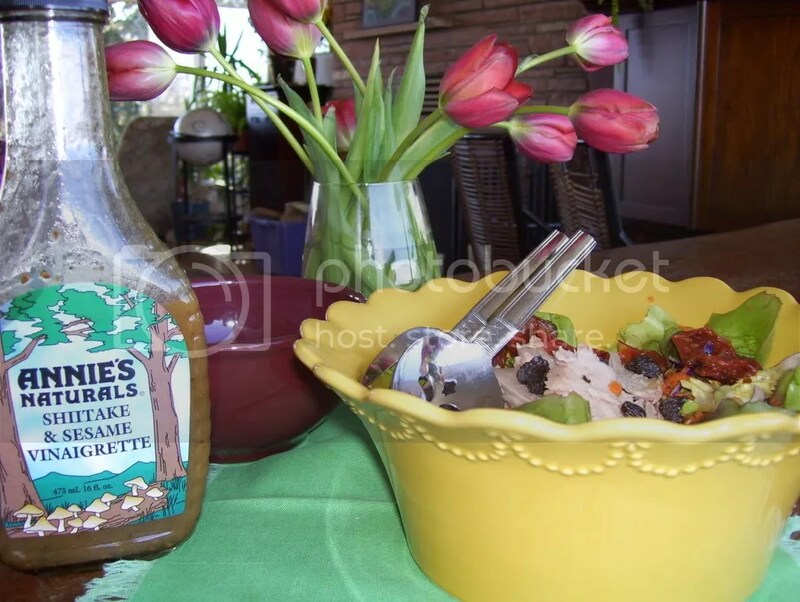 Annie's Shitake & Sesame Vinaigrette. Lots of flavor, no fake stuff. Depth is the most important thing to look for (besides being cute and coordinating with your current dishware, of course.) While there are plenty of salad serving bowls, most are too shallow and/or flared to contain a feisty salad. In the picture, I included a regular soup bowl for a point of comparison. If you are looking for a good bowl on-line, I happened upon one at Silvermark’s site: http://silvermk.com/product_detail.cfm?id=16. You can also find all sorts of other great salad-making apparatuses there. As with anything, watch out for imbalances. In the case of salads, the imbalances can come in a couple forms: Non-vegetable ingredients and salad dressings. First, keep in mind that big bowls are a trick for eating more vegetables, not oversized amounts of ham, cheese, smoked turkey, pasta salad and myriad other non-vegetable toppings in a typical salad bar. Homemade salads aren’t usually overburdened with high-calorie additions, since who has the time to prepare them? But faced with a salad bar spread of enticing toppers, all cut and ready to go, it’s easy to overload. Second, we know that the calories in dressing can often outweigh those in the salad itself! Big bowls are a way to strategically spread the dressing so it is put to effective use. This way, it’s possible to dress a larger portion of salad vegetables with the same amount of dressing. Watch out that you don’t end up doubling the dressing as you increase salad size! If it helps, measure out the dressing before adding. If your salad could still use a little kick after it moderately dressed, here’s another trick: Instead of ladling on more salad dressing, sprinkle on some extra vinegar (e.g., brown rice or balsamic), some freshly squeezed lemon juice, a few grinds of pepper or a shake of cayenne. Even salt (just a little) can help bring out the flavors without a lot more calories.